Hackathons are one of our favourite ways to foster a culture of innovation at PNI. Each year we have two full days of hacking, which conclude with demo presentations. Each project is evaluated based on its level of innovation, business value and feasibility. The competition is always a great time, rich with brilliant ideas. And this year we upped the ante for the winning teams. The prize: A trip to San Francisco to compete alongside 800+ developers in America’s largest challenge-driven hackathon, DeveloperWeek. Interested? Check out our post-Hackathon rundown. Members: Krunal Jadeja (Senior Developer), Nanda Rampura (Junior Developer), Srikanth Reddy (UI Developer) and Michael Dolan (QA Analyst). 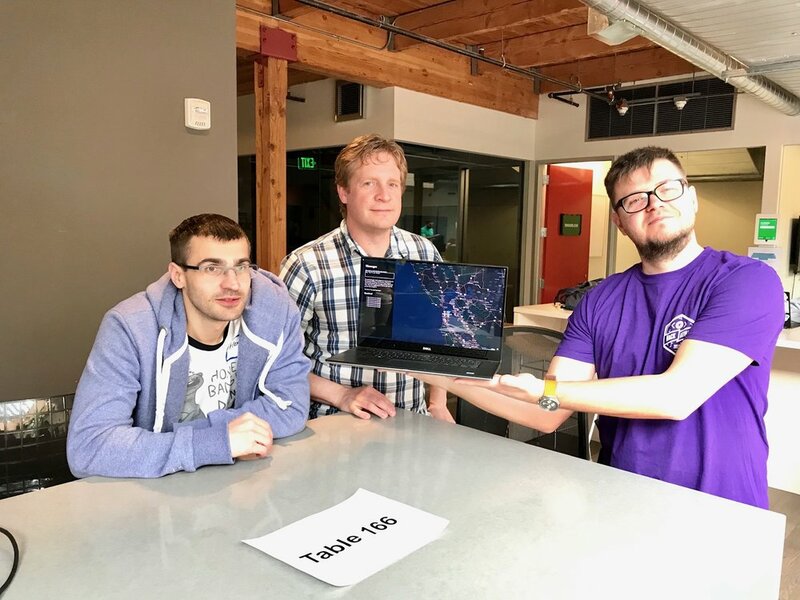 Members: Alexey Slovtsov (Senior Developer), Troy Dycavinu (Lead Developer) and Igor Olinikov (Solution Architect). 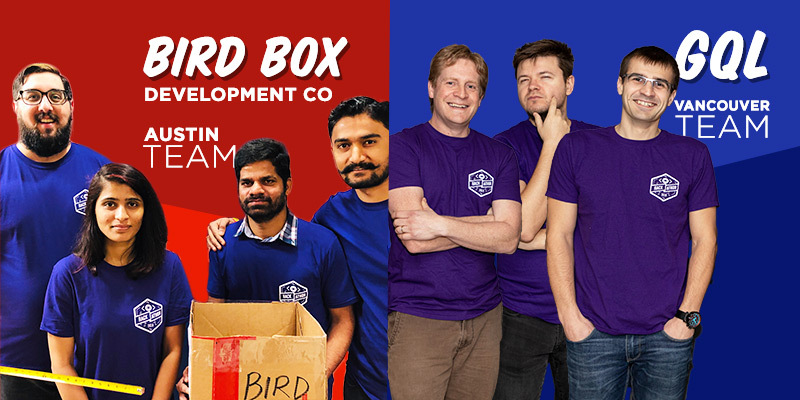 Team Bird Box: A package optimization application for retail shipments which automatically suggests appropriate package sizes and calculates shipping rates based on the products selected for shipment. Team GQL: A validation tool which automatically checks all web application builds and releases against the latest Microsoft Azure DevOps standards and produces a list of errors and recommended solutions. Team Bird Box and Team GQL were the winners of our hackathon this year, which earned them tickets to SF to compete on a larger scale. In a new city, PNI’s top teams took on new identities. For the DeveloperWeek Hackathon, Krunal, Nanda, Srikanth and Michael became Team Elementary School. Alexey, Troy and Igor became Team Pigeon. Team Elementary School: An online document-signing portal designed for schools. It allows teachers, parents and students to provide authorized signatures and approvals on report cards, leave requests and more. Team Pigeon: A 21st century twist on the carrier pigeon. The Slow Messaging System (SMS) tool is made for enthusiasts who keep the pigeon postal service tradition alive for history and education purposes. There’s no doubt about it, competing on a national level at a conference in the Silicon Valley is a totally different vibe than our in-house hackathon. “Lots of smart people came to this event to really compete, and not just have fun. And the teams were formed accordingly,” Team Pigeon explained. Groups were strategic about building cross-functional powerhouse teams, ensuring they had a star player from front-end, back-end, product/API and a great presenter. Everybody had to up their game to have a shot at a prize. You had to make a solid business case and prepare a great sales pitch. Their thoughtful planning worked, securing a 2nd place score in the sponsor’s challenge. The conference brought PNI’ers together with other talented, like-minded people from across the globe. “We had the opportunity to speak with people from companies all over the world, hear about their products, and their stories about the way up from a small startup to a big name company,” Team Pigeon said. Building an app from scratch in two days - in an international competition - is an awesome achievement. The rest of us at PNI are so proud of these teams from Austin and Vancouver. Beyond the excitement of the conference, it was a great trip overall. Teams got to spend time exploring what San Francisco has to offer—they hit up great restaurants, did some time at Alcatraz, and basked in the sun with the seals at Pier 39. Now, who’s ready for next year’s competition?